Illustration from first edition of Following the Equator. I suppose he is the hardest lot that wears feathers. Yes, and the cheerfulest, and the best satisfied with himself. He never arrived at what he is by any careless process, or any sudden one; he is a work of art, and "art is long"; he is the product of immemorial ages, and deep calculation; one can't make a bird like that in a day. He has been reincarnated more times than Shiva; and he has kept a sample of each incarnation, and fused it into his constitution. In the course of his evolutionary promotions, his sublime march toward ultimate perfection, he has been a gambler, a low comedian, a dissolute priest, a fussy woman, a blackguard, a scoffer, a liar, a thief, a spy, an informer, a trading politician, a swindler, a professional hypocrite, a patriot for cash, a reformer, a lecturer, a lawyer, a conspirator, a rebel, a royalist, a democrat, a practicer and propagator of irreverence, a meddler, an intruder, a busybody, an infidel, and a wallower in sin for the mere love if it. The strange result, the incredible result, of this patient accumulation of all damnable traits is, that he does not know what care is, he does not know what sorrow is, he does not know what remorse is, his life is one long thundering ecstasy of happiness, and he will go to his death untroubled, knowing that he will soon turn up again as an author or something, and be even more intolerable capable and comfortable than ever he was before. In his straddling wide forward step, and his springy sidewise series of hops, and his impudent air, and his cunning way of canting his head to one side upon occasion, hereminds one of the American blackbird. But the sharp resemblances stop there. He is much bigger than the blackbird; and he lacks the blackbird's trim and slender and beautiful build and shapely beak; and of course his sober garb of gray and rusty black is a poor and humble thing compared with the splendid lustre of the blackbird's metallic sables and shifting and flashing bronze glories. The blackbird is a perfect gentleman, in deportment and attire, and is not noisy, I believe, except when holding religious services and political conventions in a tree; but this Indian sham Quaker is just a rowdy, and is always noisy when awake--always chaffing, scolding, scoffing, laughing, ripping, and cursing, and carrying on about something or other. I never saw such a bird for delivering opinions. Nothing escapes him; he notices everything that happens, and brings out his opinion about it, particularly if it is a matter that is none of his business. And it is never a mild opinion, but always violent--violent and profance--the presence of ladies does not affect him. His opinions are not the outcome of reflection, for he never thinks about anything, but heaves out the opinion that is on top in his mind and which is often an opinion about some quite different thing and does not fit the case. But that is his way; his main idea is to get out an opinion, and if he stopped to think he would lose chances. I suppose he has no enemies among men. The whites and Mohammedans never seemed to molest him; and the Hindoos, because of their religion, never take the life of any creature, but spare even the snakes and tigers and fleas and rats. 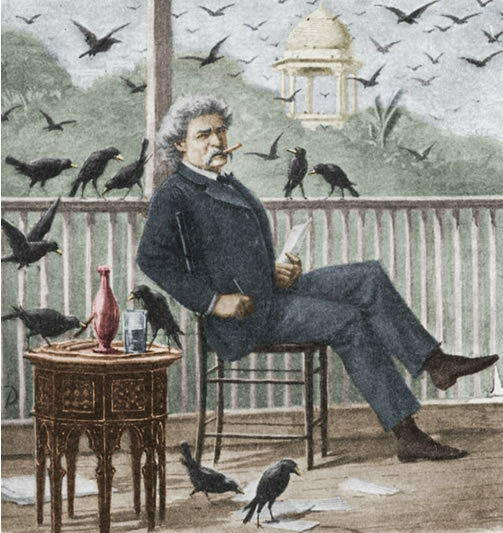 If I sat on one end of the balcony, the crows would gather on the railing at the other end and talk about me; and edge closer, little by little, till I could almost reach them; and they would sit there, in the most unabashed way, and talk about my clothes, and my hair, and my complexion, and probable character and vocation and politics, and how I came to be in India, and what I had been doing, and how many days I had got for it, and how I had happened to go unhanged so long, and when would it probably come off, and might there be more of my sort where I came from, and when would they be hanged, - and so on, and so on, until I could not longer endure the embarrassment of it; then I would shoo them away, and they would circle around in the air a little while, laughing and deriding and mocking, and presently settle on the rail and do it all over again. They were very sociable when there was anything to eat - oppressively so. With a little encouragement they would come in and light on the table and help me eat my breakfast; and once when I was in the other room and they found themselves alone, they carried off everything they could lift and they were particular to choose things which they could make no use of after they got them. In India their number is beyond estimate, and their noise is in proportion. I suppose they cost the country more than the government does; yet that is not a light matter. Still, they pay; their company pays; it would sadden the land to take their cheerful voice out of it.